Signing of "La madre y el nino"
The color treatment of her oil works have been compared to Gauguin's and her mastery of watercolors to Sargent's. For us, the emergence of Filipina artist Maria Pureza Escano is a breath of fresh air into the abstract-dominated international art scene. Her oils have contributed a new advancement to modern art. Her watercolour method is a new and brilliant approach to Realism. Is she a surrealist? A realist? A symbolist? An expressionist? Escano is all of these but, quintessentially, none of these. Always evolving, Escano, in a short period of two years, has produced a body of work that is a curator’s dream - boldly mercurial, experimentative yet, always intuitive. But what draws us to her works? What makes Escano's art unique? The answer is as simple and as quintessential as the meaning of art, itself. 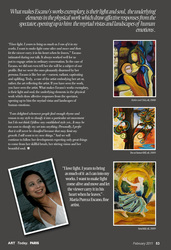 Escano's works are truly self-expressions, the vision and voice of her soul. 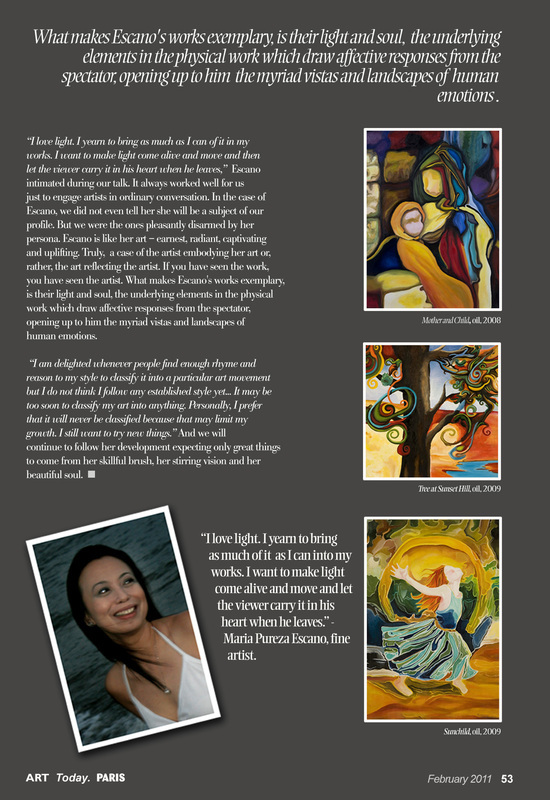 Although, she is always quick to humbly credit the influence of many masters in her growth, for us, Maria Pureza Escano's art is her art. Unstudied (she does not have formal training in art) yet sensible in technique, her brushworks are never only about exposition of skill but are songs of her soul sung as freely and as candidly as a birdsong. “Sunchild” (oil, 2009) is our favorite representative of Escano art. At first glance, we are reminded of the works of the Cloissonists, a style which was made popular by Bernard and Dujardin in the 1800s. But her lines are bolder and well defined and she outlined her flat surfaces with lighter lines, imbuing her forms with ambient light (or its impression) and producing an almost stained-glass effect to her elements. “I love light. I yearn to bring as much as I can of it in my works. I want to make light come alive and move and then let the viewer carry it in his heart when he leaves,” Escano intimated to us during our talk. It always worked well for us just to engage artists in ordinary conversation. In the case of Escano, we did not even tell her she will be a subject of our profile. But we were the ones pleasantly disarmed by her persona. 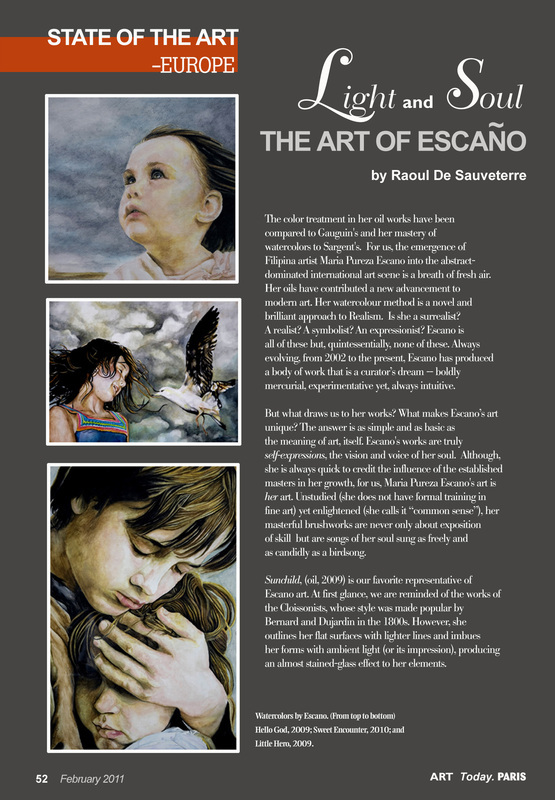 Escano is like her art – earnest, radiant, captivating and uplifting. Truly a case of the artist embodying her art or rather, the art reflecting the artist. 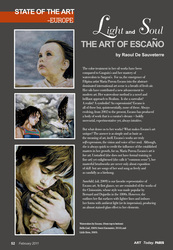 If you have seen the art, you have seen the artist.What makes Escano's works exemplary is their light and soul, the underlying elements in the physical work which draw affective response from the spectator,opening up to him the many vistas and landscapes of human emotions. “I am delighted whenever people find enough rhyme and reason to my style to classify it into a particular art movement but I do not think I follow any established style yet... It may be too soon to classify my art into anything. Personally, I prefer that it will never be classified because that may limit my growth. I still want to try new things.” And we will continue to follow her development expecting only great things to come from her skilful brush, her stirring vision and her beautiful soul.